Professor Jayashankar Telangana State Agricultural University (PJTSAU), Agricultural Polytechnic Admission Notification 2019-20 for Agricultural Polytechnic Diploma Courses in various collages under PJTSAU in Telangana State. Application fee for applicants belonging to OC and BC category is Rs. 1100-/ (including processing fee) and for applicants belonging to SC / ST / PH category the fee is Rs. 600/- (including processing fee). The applicants have to select debit card / credit card / net banking option to pay the application fee and to follow the online instructions to complete the process of payment of fee. The students can apply online from given below link and also download the application from website and sent to PJTSAU. PJTSAU Agriculture Polytechnic Diploma Admission based on 10th Grades (GPA). Certificates verification from 26th June 2018 to 5th July 2018. Full details given below. The candidates in the ratio of 1:10 in each category are called for verification of their certificates on the following dates from 10.00 AM onwards. 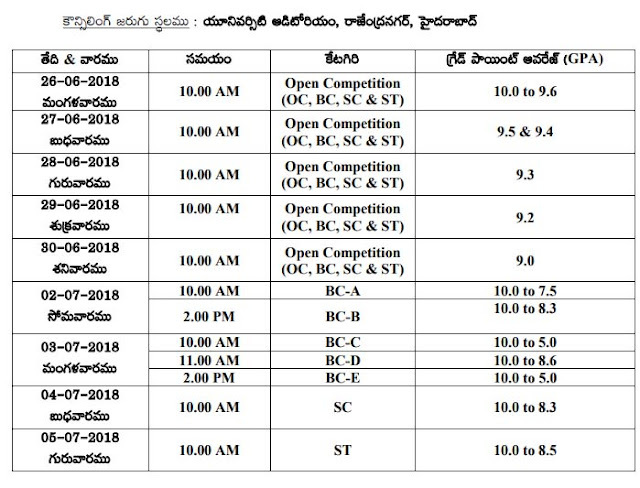 Venue: Examinations Centre, Opposite W.T.C., Near College of Agriculture, Professor Jayashankar Telangana State Agricultural University Campus, Rajendranagar, Hyderabad - 500030. GOOD EVINING SIR, IAM SAI,I WAS APPLIED AGRICULTURE CEET,MY GPA IS 8.7 & HAVE NCC CERTIFICATE.SO, I GOT MY AGRICULTURE POLYTECHNICK CEET SIR. Its depending upon competition, counselling schedule expected to be released in the last week of this month. Last year taken upto 9.2 GPA only for the Telangana area. good after noon sir,i am sai kumar ,sir agriculture polytechnic selected candidates list when set in online. tomorrow or day after tomorrow release the counselling notification on news papers. I Am K Srinivasulu from Mahabubnagar, I applied for B.Sc Agr with Form A, As I have written Eamcet and secured rank in that. I am waiting for the Results, Can you kindly inform me when the results will be published. ANGRAU already released the counselling schedule for AP, but in TS PJTAU not released the counselling schedule so far, once contact the below contact details. But Sir, Can you kindly explain me what are the results announced in the below link. that list is not for AG Polytechnic, they are B.Sc Home Science candidates, students can join that course after intermediate completion, marks mentioned in that list is from Intermediate. Sir i am mounika.i had applied for agricultural polytechnic&my 10th GPA is 8.7.am i eligible to get the seat&when the counselling dates will be issued? please wait for counselling schedule, cut off GPA will be published in the counselling schedule..... expected in this month end. Sir iam Deekshith I have got 8.7 in ssc i have applied for agriculture, my caste is sc is there any chance of second counselling, can I get seat sir please tell sir. yes your counselling date is 1st August, for full details visit pjtsau.ac.in website. so your counselling date is 29th July 2015. Yes Present, Ag diploma have good job opportunities than polytechnic engineering because there is limited seats available. given the last year cut off GPA OC, BC, SC, ST etc, please verify the table once. Among the three courses (diploma un agrcltr, seed technology, agrcltrl engnrng) , which one is d best? I want suggestions of u sir.. I don't have knowledge about this courses, Please consult any of the Agriculture student. its depending on age, once read the eligibility conditions after release the notification. Good morning sir. When will release the notification of diploma in agriculture for the academic year 2016-17. We r waiting for the notification. Kindly give me an information about the notification. will be released in this week or next week. Hi Sir , I m from khammam , I hv passed SSC with GPA 6.0 , I hv ncc certificate also, I belongs to St category, can I get seat in any polytechnic courses in agriculture... PLZ guide me..
please download and read the notification, and eligibility details, atleast 4 year your study in rural area. hello sir, I am ajitha I have applied for polytechnic course, I got 9.0 gpa in ssc,I am waiting for the result..How much time it will take to know the result status.and when will be the councelling dates ? it will be published on all news papers in this week. counselling schedule (10th grade points wise) will be published soon in this week. Sir,when the counselling is going to be held? Sir, am goli.divya rani,I am from nizamabad,Sir when the university is going to release counselling schedule? Sir, when the counselling is starting, they said that counselling is from8 th date, sir is it true? counselling schedule will be published in the news papers. yes eligible, but time out for apply. sir, this is aravind i got 8.5 in ssc under the category- BC-D. is there any chance to me to attend the counselling. please tell me sir im requesting you. 10th class with at least 4 years of studied in rural area are eligible. They not mentioned cbse or state board. If you studied in rural area ask the university once. for admissions in B.Sc. (Ag) based on EAMCET. May be first week of June. Sir, can u say the notification details of 2018 year. when the notification will be released. Please read the above last year counselling details . It will clarify you question . Last year they called upto 8.8 GPA only. This year may be no chance for you. If less applicants applied, you can get seat.